I’ve gone to every Relay walk since 2007, when an old friend told me about the first one. Last year in 2010 was the first I did do as part of a team, the Passionate Redheads. The event then was truly a blast. Some yearly events I’ve gone to, the old feeling of excitement of the first time isn’t there. But that certainly wasn’t a problem here. Just before noon SL time on Saturday July 16th, I arrived at the castle set up on the four corners of the sims the four sims RFL Wish, Unity, Voulenteer, and Treatment. The place needed the capacity of four sims as it was truly packed. When I brought up the map, I counted a total of 127 avatars in four sims. I watched the event along with fellow Redheads Nydia Tungsten, Treminari Huet, Lomgren Smalls, and Skylark LeFavre, along with a variety of other avs from tines to merfolk to superheros to robots. There were a number of speeches given at the opening, but one stood out. Bootedgirl Foxtrot gave a speech that could be done only through a computerized voice. Cancer had taken away her larynx. I relay for, each day we all can awake, with the gift of time we are given, to see the world, and love and be loved, and continue to pass on the very hope that will live on forever. I relay for the dream, for more time, for all those touched with cancer, to have quality time, in life, without pain. I relay for each day I awake, for each moment I see my Second life partner, my Love Jay, who saw me through many late hours of pain, and now enjoy many late hours of laughter. I relay for others to have what I now have, a chance to live and give back hope, and help however I can. Shortly after her speech and the cheers that followed, the hour was up, and it was time for the Survivor/Caregiver lap. Those whom had faced the disease and survived, and those who cared for them, were invited to take the first of the official laps. Some Sunweavers such as Elphias Kojishi walked the track. Others just went to our camp and cheered them on. Among them was Rita Mariner, back as a purple bunnygirl after being “pardoned” from her remaining time stuck as a human. Two of the Redheads, also bunnygirls, did their cheering in cheerleader outfits, which was an interesting sight for the guys walking the track. As the survivors and caregivers walked, someone pointed out that the music being played was written just for the Relay. Our camp “Peace to All Who Enter Here,” was a peaceful forest area, with a gateway of roses. Virtual critters such as squirrels and deer walked about the place. The center was dominated by a huge tree. the back of the camp had a picturesque waterfall. There was also a ride, a balloon, that took riders over the camp for a few minutes. A prayer book recorded messages, which then floated into the virtual breeze. 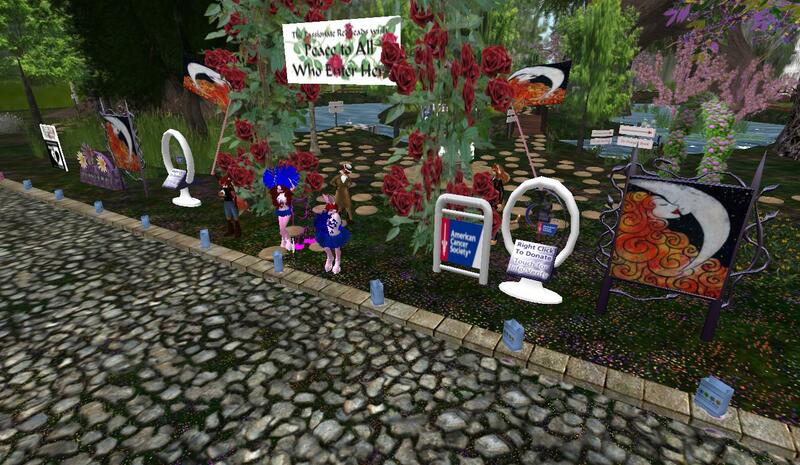 A number of Second Life notables took part in the Relay. Some such as Bryn Oh had contributed builds. Others did the Walk. Among them was Jaycatt Nico of the noted “Jaycatt & Frogg” musical pair. He greeted me and the rest of the Sunweavers, hung around a few minutes, and made a good-sized donation before leaving. Blogger DrFran Babcock walked by and gave a hello. I also saw two longtime friends Breezes Babi and Glitter Xeltentat walk by. One of the Relay staff, Samara Barzane, came by as a pink catgirl. The total number of people I recognized, well, not enough room to mention them all. And then, it was the team’s turn to walk. With Danneth Kivioq, Rita, and Dusk leading the way, we got on the track and began walking, waving our huge Sunweaver flags. Helping us was an accessory called a “walker” that was worn on our backs that allowed us to walk automatically while typing, or taking pictures. We just needed someone to follow. And so, we began our journey down the track, those without walkers picking them up at one of the stops along the way. 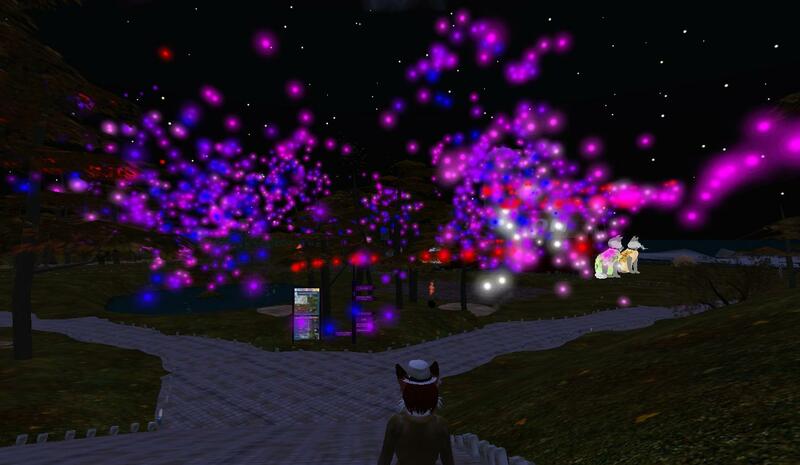 The Relay’s theme this year was “Season of Hope,” and many of the sims reflected the seasons. The northwest had spring, the southeast had summer, including the water sims with a beach area, the southwest had autumn, including a school for the youngsters, and to the northwest winter, most of the sims there snowed over. The Redhead’s camp was in RFL Family, in the northeast corner near the middle. And going throughout the track, we found a variety of builds. Some were very well done and imaginative. Unfortunately with all the people on the track, lag was a persistent problem. A time or two it was so bad that the teammates around me were all rendered invisible. And there were times some of us were left behind due to it, and someone would have to port us forward to rejoin the group. We had to stop a few times due to a sim that was closed from further people entering, appearing like it vanished. And a few times I would just up and crash. And I didn’t reappear where I crashed, but where I had logged off the previous night, at the rest stop sponsored in Artistic Fimicloud’s name. By some coincidence, the first time this happened, my teammates caught up to me, which got a few comments from them. For the themed laps, many of us dressed for the occasion. On the “I Can’t Believe I’m Wearing This!” I went back to the human avatar I wore after my “Bid Me Human” Event. 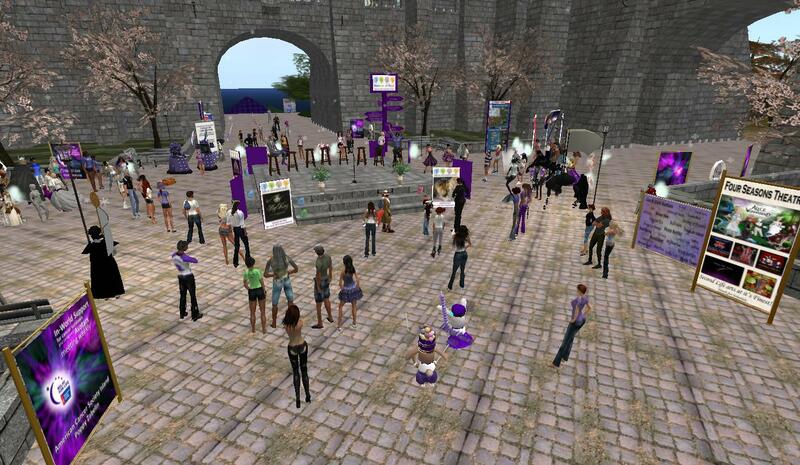 Others had some avatars that certainly drew attention. On the “Ride Your Favorite Horse,” I tried to bring out my mount, but for some reason it wouldn’t rezz. At times, we didn’t walk, but took a moment to look at some of the builds. This included the Steampunk New Babbage, or the Activity Water Region. There was also a scavenger hunt taking place, mostly in the four corner sims, where one had to find the objects on the list. Over the group chat, I heard of “Bid me Bald” events being done. But one lady had a different idea, a “Pumped Up for Relay - Evangeline Ling, Co-Captain in team Relay for HOPE will be getting PUMPED UP and will be a body builder for every 1000 L donated to her challenge kiosk.” Enough was raised to give her an athletic look for several weeks. to ride on the crest of a wild raging storm. in search of the answers of questions unknown. the men who have served you so long and so well. Yours truly had to take a break to get some sleep, but woke up a little early to rejoin the Relay. This time, a couple Redheads whom couldn’t be there Saturday made it on Sunday, notably Alleara Snoodle. In previous Relays, Alleara had either helped with the building or designed items such as clothes. But this year, events in real life simply couldn’t be put aside. Fortunately, she was able to join her teammates this day. The Passionate Redheads officially reached “Platinum” status at the Relay Walk. Daaneth made the announcement sometime on Sunday, “Congratulations on all your hard work. You have made me proud to be a Redhead.” And for every Relayer in all of the teams, a small “Teamwork Awars” trophy was delivered. Finally at 10 AM were the closing ceremonies. Getting back to the castle, the walls and avatars alike took a good deal of time to rezz. Congratulations to all had been going around since the morning, and continued at the closing. Why I Relay I had never heard of RFL before in my life, even though I watched my step father slowing die from cancer, it was here in Second Life that I learned of it as I listened to some one speak of it, she was describing someone to me that she had lost as well, and I heard others speak of her, that is how I got to know Fimi, and Dusk Invited me to the RFL Team "Passionate Redheads" since then I lost someone else dear to me Kamryn Noel, so I run for all of them, and for you all. I even run for me. When I was a kid my cure for a sunburn was to get another one on top of it. So now I have moles all over my back that I need 4 to 6 biopsied each year. I am terrified that one day I will get the news that I have it. But I will always relay for all of you no matter what. My own reasons to Relay? Cancer doesn’t run in my family, but it has taken down those around me in real life. Neighbors, coworkers, and family pets. Here in Second Life, I’ve met a number of friends, including the Sunweavers whom make up much of the Passionate Redheads. I arrived too late to have known Fimi, but I can’t help but admire her from how she continues to be talked about. Funding and research do work. More treatments are discovered. More methods found. And survival rates for some cancers have gone up. The true cure for all cancer still eludes modern science. But throughout the history of medical science, one disease after another that was once a death sentence have found cures and treatments that work at any stage of discovery. Maybe this will be the year a team of scientists makes the public announcement we’ve all been waiting for. 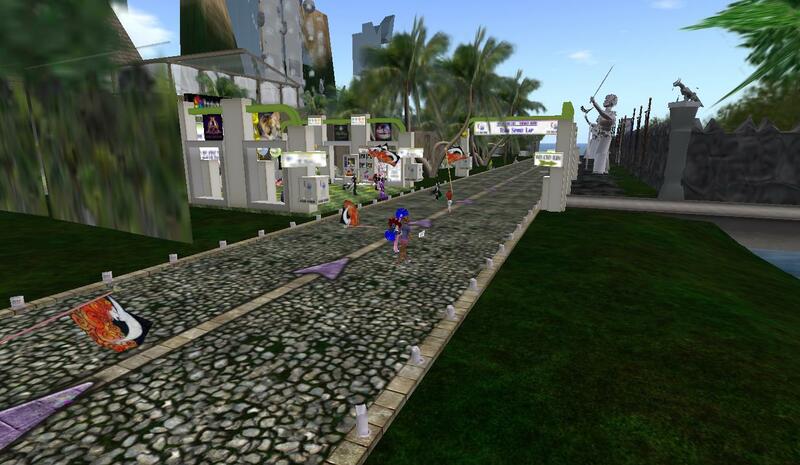 So until then, the Relay for Life will continue on, both in real life and in virtual reality. Following the closing ceremonies, there were a display of fireworks outside the castle. And there was one last official lap, the Victory lap, the one taken in celebration. 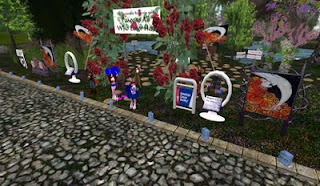 At Noon Second Life time, the 2011 Relay for Life Walk was officially over. But the Relayers remained on the grid, continuing to walk laps, explore the builds, enjoy the attractions, or just meet up for a good party. Hours later, I ran into Team Steelhead and Fuzzball Ortega still whooping it up. The fun continued for the next few days. A few builds went down on Monday and Tuesday, but most stayed up until Wednesday night. Of the unofficial parties, two stuck out. On Tuesday was the second annual “flood party," the first one last year coming about on a whim. And Wednesday had a small “Tear-down party.” On Thursday at Noon, what builds remained were removed. It was then that the Relay for Life Walk was truly over for another year. The fundraising season isn’t officially over yet, though. August 20 is the official closing event. And once that’s over with, comes the planning for next year, and the planning for the next Relay track, with teams trying to make their next builds better than ones before. And of course, continuing to meet up with the new friends we made, and old friends we caught up with. Wonderful article. Bixyl! Thank You!